Sandra Isidore enters the Eugene O'Neill Theatre stage atop a staircase, ready to inspire Fela Kuti to stand against the military dictatorship in Lagos, Nigeria. It's a dramatic entrance for a character that Saycon Sengbloh, the actor who portrays her, describes as a "fighter." Sengbloh should know one when she sees one. She had to fight her way to the top of that staircase. 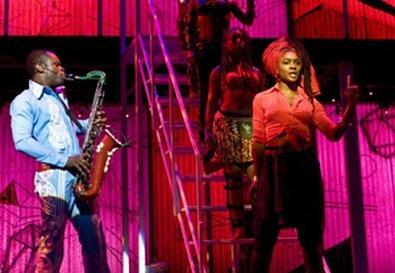 Sengbloh, 32, co-stars in "Fela!" the concert-style musical that opens on Broadway Nov. 23 and tells the story of Nigerian musician and activist Fela Kuti. Long before she took the stage for the first time as Kuti's lover, the Harlem resident began performing at Tri-Cities School for the Visual and Performing Arts in her native Atlanta. (There she first worked alongside Sahr Ngaujah, now her leading man in "Fela!") During her high school years, she also studied under Freddie Hendricks at the Youth Ensemble of Atlanta, an award-winning African-American youth theater company. Performing in YEA productions gave Sengbloh a taste of the kind weighty material she would find herself dealing with years later in "Fela!" "We did really serious works," Sengbloh says, recalling roles in "Time," dealing with the HIV/AIDS epidemic, "Psalm 13," about teen pregnancy, and "Soweto! Soweto! Soweto! A Township is Calling," set in apartheid-era South Africa. After high school, Sengbloh chose not to attend a conservatory, opting instead for Agnes Scott College, a women's liberal arts school in nearby Decatur, Ga., where she studied Spanish and music. Her theater experience continued outside the classroom, performing in television, in films, and onstage—namely in Tyler Perry's "I Know I've Been Changed" during her sophomore year. Sengbloh believes that if she had gone the conservatory route, the opportunities that set the early foundation for her career wouldn't have been materialized. "It helped my career in the long run," she says. "They were very good in that I would book a movie and they would let me go." Sengbloh left college mid-junior year to focus on her acting and music careers. A breakthrough came after her sixth time auditioning for the national tour of "Rent" when casting director Bernie Telsey handed her the role of Mimi, usually portrayed by a Latina actor. Sengbloh credits the non-traditional twist with opening "a lot of doors." Telsey later cast her as the standby for Elphaba in "Wicked," making her the first African-American to perform the role on Broadway. With an R&B album ("Southern Pin-Up"), and an originating role as Nettie in Atlanta's world premiere of "The Color Purple" under her belt, Sengbloh made a stop in "Hair," before landing the role of Isidore. The daughter of a Liberian-born father and a Georgian mother, Sengbloh describes the part as a perfect match, and says she reconnects with her African roots with every performance. "I feel like I've stepped into being myself," she says. "This show is the happiest I've been in my career so far. Fela! is new. It is avant-garde. It is theater. It is mixed media. It is fresh. It is something totally different. I wanted to be a part of that,"
Her enthusiasm extends to working with director and choreographer Bill T. Jones. She joined the cast years after reading the Tony winner's passage in "Sepia Dreams: A Celebration of Black Achievement Through Words and Images," and emailing the author to describe just how touched she was by his words. Now, Sengbloh is creating a role for Jones on Broadway, telling a story of perseverance in trying times and hope for a better future. "It was integral to my life to do this show," Sengbloh says. "I feel really inspired."